What is the work in your heart? How many times have you heard the words “Don’t give up on your Dreams!”Sometimes those words resonate and inspire you, yet at other times they feel hollow and unattainable. Initially the energy and intent to achieve your dreams, even without obvious results, comes easily and naturally. You continue day after day, often for long periods of time maintaining your belief and enthusiasm. Then one day you experience a lull in energy and enthusiasm. It becomes a challenge to inspire yourself to continue, especially if you are working for yourself. Sometimes in these empty moments a spark remains to warm your dream, yet at other times maybe due to circumstances out of your control, this dream becomes no more than a dull ache in your heart. During a time of when the spark was fading on my dreams, something special occurred. A blue triangle Butterfly landed on my arm as I stood overlooking Fig-Tree Bay near my home. Excited to be visited by one of nature’s creatures I focused on the butterfly’s silent beauty. To my delight the Blue Triangle butterfly stayed on my arm when I returned home. As I focused on my visitor I realized it was the same butterfly on the cover of my first book Triumph of Joy. To my delight the butterfly continued to sit on my arm for several hours as I worked on my computer. While the butterfly sat silent and unmoving I felt a stirring within, an excitement I had not experienced for quite a while ~ I wanted to write again! My heart sang as and I offered up gratitude to the beautiful butterfly. This silence or void is a place of infinite possibilities. A place to rest and nourish our hearts and minds. Our thoughts, dreams and life experiences made us who we are, and will sustain us in creating new ideas and new beginning. Patience and kindness to self will enable you to move forward one again. If you build castle in the air, your work s not lost, that is where it should be. Now put new foundations under them.~ Henry D Thoreau. Feel the living promise that is you. At times the living promise within you pulses so strongly that you feel you can fly. It opens your heart and mind to dream as you float in this glorious place of unlimited possibilities, filled with hope and gratitude for all that is. At other times the joy and wonder of this universe within becomes diminished, sometimes for weeks, months or years. The music of the soul dims as Hope struggles to warm a lost and saddened heart. Yet the living promise remains to take you on a journey to the true of who you are. Finding a way to make peace with life’s challenges and to remain open to our living promise may mean focusing all your energy on the present moment and seeking something that brings you joy. Even if that something seems insignificant to others. Little by little you can extend that focus as you claim your place in this beautiful world of ours. At one time my heart was so heavy I struggled to focus on anything or free myself of uncertainty. It came about that I bought a tuning fork that resinated to A. When I played the running fork it sound like the buzz of a bee. The sound of the bee reminded me of the honey of life I was missing out on. After that bees appeared all around me in one form or another. With the tuning fork I felt I was recalibrating my heart to the living promise and joy of who I am. What joy enables you to feel the beauty of your living promise? Have you ever felt that you were never going to achieve your desired dream? You work conscientiously and seem to be constantly moving forward, yet when you look up for a moment it appears you are no closer to your goal! At times inspired thought moves you forward, you feel energised and thrilled with your progress and even though you can’t see the end in sight you know it’s there on other side of the bridge you are building.Then there are days when self doubt seeps into your soul and your dream seems to disappear before your eyes as your bridge of positive intentions melts away. Recently I decided to walk across a bridge which appeared from the distance to have a gentle sweeping incline.The fact that the bridge appeared to have a gentle incline was not the reason I chose to walk over it – rather it’s the perception I had of the the Gladesville Bridge Having made the decision to walk the bridge, I set out with a good pair of hiking boots, great enthusiasm and a bright blue sky above.Surrounded by panoramic views of the numerous magnificent bays that thread their way along the Parramatta River,I looked forward to my adventure. My heart filled with gratitude as I strode purposely ahead. Before long I realised,the ascent was much steeper than the perception I had created in my mind. “ That’s great.” I thought as I strode along. “An even better workout .” To my surprise not only did the arch of the bridge continue to steepen, but before too long I had to lean in to stay upright. On and on and on I walked … So steep did the bridge walk become I began looking forward to seeing the top of the arch, just so I could gauge the true length of the bridge. “There has to be a point.” I told myself “Where I will be able to see where I am in relation to the other side of the river.” In an endeavour not to focus too much on seeing the other side I focused fully on enjoyed the walking experience,the expansive blue sky, the beautiful bay below. Yet no matter how many steps I took no halfway point appeared for me to gauge my position. In truth there was no midway ~ I had not idea how close I was to my destination until I arrived. In a light bulb moment , it occurred to me that is what life’s journey is about . Do we not constantly monitor our process as we built our bridge of positive intentions? Do we not constantly question ourselves as to where we are in relation to our dream? During my bridge walk, although I was unable to see my destination ~ it magically manifested. What does a Maze mean to you? 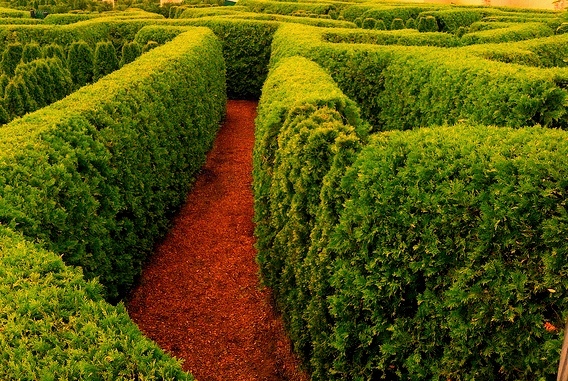 The dictionary defines a maze as an intricate, usually confusing network of interconnecting pathways. A labyrinth to bewilder, mystify or astonish. Have you felt disorientated at times ? As if you are in a never ending maze that drains you of energy and inspiration. Having to “unlearn” things that no longer serve us can be exhausting and bewildering. Do we give up on our dreams because we cannot see a way ? Do we continue to follow pathways that appear to go nowhere? How can we make choices on a daily basis when we are not fully present with who we are? The further you travel from your true self; the more disoriented you become. An emotional labyrinth may block our path, but what if we looked up into an endless expanse of blue sky? Do you then feel a sense of unlimited expansion? It may be as simple as walking a different way on your morning walk or run. Exploring new pathways and enjoying delightful experiences just a street or two away. A new world of wonder may open to you. A change of perspective. A simply decision to walk a different way might make you feel reborn, inspired and renewed, it did for me! A poppy ~ one of lifes’ small blessings. A lovely friend of mine saw poppy flowers around me while we were chatting. She was kind enough to share their meaning with me. “Poppies guide your desires into physical manifestation. Your wishes become tangible. The message from poppy is not to give up! Your dreams are closer to reality than you think. It’s magical how the universe provides little gifts of guidance along our journey. My dream did seem to be drifting out of reach but my friend’s words have encouraged me to continue to believe in my dream. 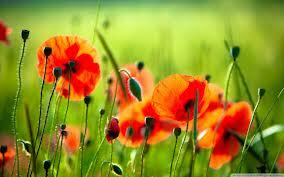 The poppy also have deep significance as a flower of remembrance. My personal connection with the poppy is the unforgettable memory of a line of men placing poppies on the coffin of my late husband to honour his memory. A garden of red poppies, surrounding a lone slouch hat. A poppy ~ one of life’s small blessings.